We got this box of Awake caffeinated chocolate sent to us and I was debating whether or not an average tasting chocolate bar was worth writing about. But since it combined 2 of my daily food groups, Chocolate and Caffeine, I figured it's a notable product thinking "why didn't anyone come up with this before?" Awake has 101 mg of caffeine in every bar. That's as much as a 20 oz coffee or 250 ml energy drink! You might think "great, just what we need, another way to jack everyone up." Indeed the convenience store shelves are already busting out with caffeine delivery systems, but let's face it, there's a huge desire or need for these products in the market, and a caffeinated chocolate bar addresses a particular niche of that market. 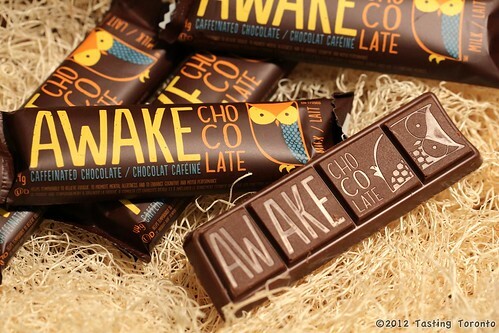 Awake plans to make a huge marketing push on college and university campuses, and the chocolate bars are already widely available. They use an owl named Nevile as their mascot and you can follow him on Twitter. Focusing on a cute mascot more than the product is an interesting approach like Porter's raccoon or the Geico gecko... there's even a Pinterest board with nothing but cute owls if you like cute owls. will it keep me from sleeping if I ate a one before my evening workout? ?